Tomorrow, Grit and I hike out of our last town stop on trail, Stehekin. From here, we’ll only have four and a half days and 92.5 miles left on the PCT to hike, with one more fire closure detour. Once we reach the Northern Terminus at the Canadian border, we’ll hike another 8.4 miles to Manning Park and then our PCT thru-hike will be over. I can’t believe we’re almost done. It feels like just yesterday, yet so long ago when my mom and sister dropped me off at the Southern Terminus in Campo, California. I’ve now been hiking on trail longer than I’ve hiked with my Team Lagger trail family by a whole month! Since starting my hike back in April, so many memories have been created, new friendships have been made made, fears have been overcome and things have changed. The seasons have changed. I’ve changed. Washington has been a challenging section along the PCT, especially the last 160 miles, from Snoqualmie Pass to Holden Valley/Stehekin. Part of what has made this section extra challenging has been the weather. Up until this point, it’s been clear blue skies, sunshine and warm weather, minus the couple of rainy days into Julian, the thunder and lightning storm we got stuck in coming into Tahoe and the heavy smoke we had to endure in Northern California from Truckee on. The day Grit and I left Snoqualmie Pass, it rained. It went from being dry and warm to wet and cold. Hiking in rain gear, wet socks and shoes quickly became our new norm. Our first day back out on trail from taking a double zero day in North Bend, we were already cold and soaked 11 miles in. To make matters worse, we made the mistake of choosing an exposed tentsite at a higher elevation because it was getting dark, late and nothing else in the area was available. Our tents were soaked in the morning thanks to the evening’s downpour. It continued to rain for the next four days. In a section where the views are supposedly amazing and epic, often referred to as the “mini Sierra”, all we could see were rain clouds and fog. What a bummer, but that’s hiking in the Pacific Northwest for you. There were a few times during the five day stretch from Snoqualmie to Stevens Pass where we weren’t completely miserable with the cold, fog and rain. In these rare moments, I’d get a sneak peek of the gorgeous views around me, was able to pick up my hiking pace, take more pictures, dry out my tent during breaks and even *taught myself a clever way to dry my socks on trail. The day after Grit and I reached Stevens Pass, it poured down rain again. Thankfully we had the option to stay at the Mountaineers Lodge and waited out the weather. We spent two nights here where we had access to warm showers, several warm meals, was able to get all of our gear dried out and visited with fellow hiking friends we hadn’t seen in miles. On our second day at Stevens Pass, my dad and his girlfriend picked Grit and I up and took us into Leavenworth where we did a proper load of laundry, ate more food and resupplied for the next five days. It was exactly what we needed in order to get excited about hiking again. The crappy weather had really gotten our spirits down. Hiking out of Stevens Pass was beautiful. The sunshine came back, making the hike out of town scenic and warm. With our full packs, Grit and I were happy to be on trail again, smiling and taking pictures of the incredible views. On our fourth day after leaving Stevens Pass, I woke up at 5:30 in the morning to heavy rain coming down on my tent. The crappy, cold weather was back. It was hard to get motivated about packing up my tent and hiking uphill in the rain. On this particular day, everything was so much harder – climbing over blown down trees on trail, trying to stay upright in the slick mud, not rolling my ankle on the big rocks on trail, maneuvering tricky water crossings, trudging up and down multiple big and steep climbs throughout the day and doing my best to keep my shoes and socks dry as I bushwhacked my way through tall, wet bushes. At the top of one of the big climbs of the day, it even started snowing on me. Snowing! A little bit later, the snow turned into a heavy rain downpour. What else would Mother Nature throw at me? Towards the end of the day, I started getting “Town Fever.” I longed to get into town for dry socks, clean clothes, a warm bed and a real meal. If I pushed myself, I could get into the next town, Holden Valley, just in time for dinner the following evening. 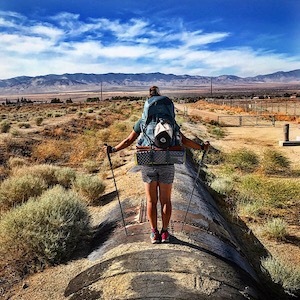 This would mean having to hike a total of 26 miles on an already tough day and hiking another 22 miles the next day, with 5,500 feet elevation gain. That would be a lot of hiking and a lot of climbing. Turns out, I got lucky with the weather on Town Day. Even though I still had the big climbs ahead of me, the weather had turned nice again. For most of the day as I hiked up and up and up in a densely forested area, I could see blue skies and sunshine peeking through the trees. Eleven miles from town, the PCT was rerouted at the junction onto another trail due to a nearby wildfire fire. Instead of continuing onto Stehekin via the PCT, we were all rerouted down into Holden Valley. From Holden Valley, we could hop on the shuttle that would take us to the ferry going into Stehekin. I knew dinner was being served in Holden Valley from 5 to 5:45pm. I reached the junction and the start of the reroute at 1:30pm. I had three and a half hours to hike 11 miles if I wanted to make it in time for dinner. In my head, I came up with a mantra for the rest of my hike into town, which was, “I am. I can. I will.” I think listening to Oprah’s podcast on repeat over the last two days was having a positive effect on me. Of course, the reroute started with a fairly steep climb up, about 1,000 feet, complete with a few sizable boulders to climb up and over along the way. Once I reached the top of the climb, I was greeted with one of the best views I’ve seen in all of Washington so far. I stopped long enough to snap a few photos and then started my descent down the trail towards Holden Valley. The thing about these reroutes is it’s hard to judge how far along you are on them. With the PCT, you can use an app like Guthooks to turn on the GPS and see exactly where you’re at on trail and how far you have left to go. Since the reroute isn’t technically on trail, you have to look at the map and make your best guess on where you’re at and how far you have to go. Knowing I was racing against the clock, trying to make it in time for dinner, I picked up my downhill hiking pace by jogging down the trail. I knew going downhill, I could pick up my normal pace of 2.5 miles/hour to 3 miles/hour, as long as the trail remained even and free of any obstacles. The trail started getting more narrow. There were a few big rocks in places I had to carefully navigate over. There was the overgrown bush section that seemed to go on for several miles, requiring me to slow down my pace as I bushwhacked my way through and did my best to avoid rolling my ankle on big rocks, holes and slippery mud on the trail. After the overgrown bush section came the rocks. It was as if someone had come along and decided it was a good idea to dump a bunch of oversized rocks in the middle of the trail. The rocks really forced me to slow down because they were tricky to walk over, easy to slip on and even easier to roll an ankle on. If the rocks weren’t annoying enough, the trail started to climb up again, forcing me to slow down even more. I kept getting more and more frustrated. What was with all of these rocks? Through the rocky section, I could feel the sprinkles starting to fall from the sky. There were even a couple of creeks to navigate over, causing me to slow down more. This late in the day, the last thing I needed was a rolled ankle with wet socks and shoes while getting rained on. I reached the dining hall at 5:45pm. I went from being up in the mountains for five days with just Grit to a room full of over 100 people eating. I was easily intimidated and clearly distraught. A couple of my fellow hiker friends saw me walk into the room and came to my rescue, helping me grab a plate full of food before they closed down the dinner service for the evening. Now as my zero day in Holden Valley comes to an end, I’ve put the finishing touches on our plan for hiking the final 92.5 miles to Canada. From Stehekin, we’ll spend our last five days and four nights on trail as we head towards the border. It feels so weird knowing our PCT thru-hike is coming to an end. This has become my normal – getting up in the morning with the sun and going to bed as the sun sets, hiking 15-20 mile days, planning my day around water sources and upcoming town stops, setting up my tent at a different tentsite each night, eating an obscene amount of gummy bears throughout the day, pooping in the woods, not showering for five day stretches, not wearing a stitch of makeup for over five months, wearing the same clothes over and over again, hitchhiking in and out of town and carrying all my worldly possessions on my back. I’ve been out here so long, it’s hard to remember what life off trail feels like. With less than 100 miles to go, what am I going to do next? If you’re ever out camping or backpacking and have cold feet and/or wet socks, boil some water in your camping stove. Then pour the hot water into a water bottle. I used a 20 ounce Gatorade bottle (the perfect size for a pair of ankle high Darn Tough socks) I’ve been carrying to mix my blue Gatorade powder in. If you have shin or knee high socks, a SmartWater bottle will work. Close the bottle tightly. Wrap your wet socks over the bottle. Put the sock covered bottle in your sleeping bag and keep it there overnight. The bottle will not only keep your feet warm, but by morning your socks will be dry. Congrats young lady. On your accomplishments. Obviously in the future you can accomplish anything you set your mind to. Best of all to you going forward. My wife and I are certain your future holds amazing things.